Happy Friday, friends! 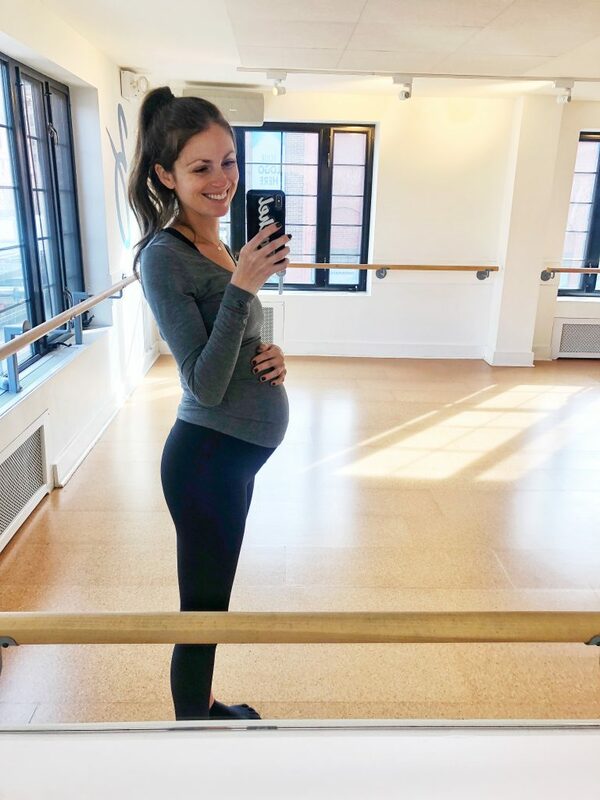 I just waddled my way home (I kid you not) from the path station and I had a float of thoughts and updates I wanted to share with you for the 29 week bump update. just shy of 29 weeks! Now that there are 11 weeks left, I am planning to do weekly or bi-weekly bump updates on the blog (last one was at 27 weeks). Really just varies on how much info I have to share, but I know how many of you love reading these (which makes me the happiest) so I am planning to share them as much as I can! 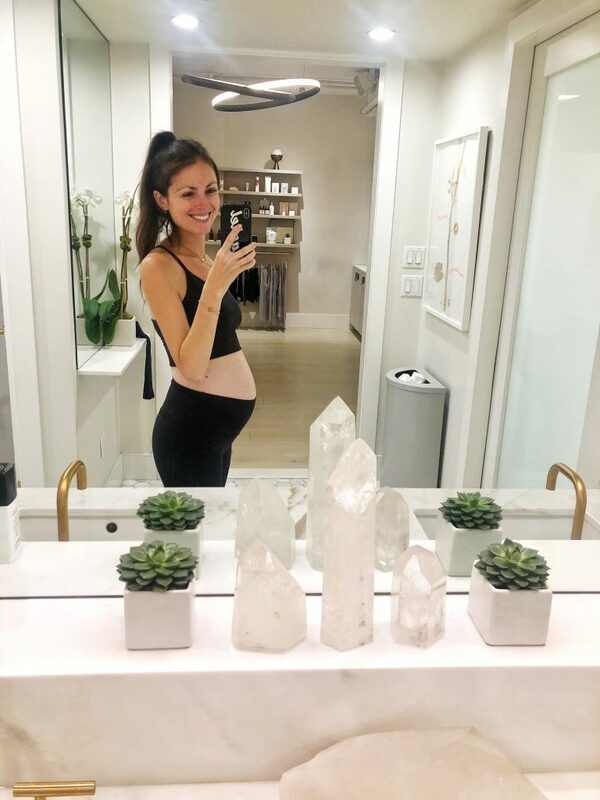 So.. the third trimester – wowza. That happened so quickly, like insanely fast. The first 20 weeks of pregnancy went at a great pace and since that point I think time is flying by! There are only an estimated 11 weeks left until our little dude is expected, which means there is a ton happening over here to get ready for him. Doctors appointments are now every two weeks instead of four weeks. I come to the appointments with dozens of questions for the doctor now and at first I only had a couple each visit. We have so many things to think about over the next few weeks and prepare for. I feel like every time we are in “good shape” there are 10 more things added to the list. Right now we are looking into the birth plan process and writing ours. I’m not really obsessed with the idea of doing this because we really don’t know to what to expect when it comes to labor. I have no idea how this bub is going to want to enter the world, but my doctor strongly recommended just jotting down some notes on what is important to us so we can keep this in mind during delivery. Cord blood banking – we need to decide if this is something we think this is something important to us right now. I like the way our doctor described it in that is something you want to get but never want to actually use. It can be life saving for some families while others never touch it, but it definitely isn’t a cheap investment to do without putting thought into it. Delayed umbilical cord clamping – I am very interested in delaying the cord clamping after speaking with a few people (as long as we can) but definitely need to do more research on this prior to committing to it and adding to birth plan. Will share more on this once I have info. I have heard just as little as 5 minutes can make a difference. Lactation consultant – a must to schedule! I have no idea what to expect or what to do when it comes to breast feeding. Sure I have learned that eating oats help milk supply, while peppermint and parsley aren’t good for it. We are ordering the pump through insurance this weekend (YAY!). But I definitely would be more comfortable with someone to call when I need help. If anyone has a recommendation of someone in Hoboken area, please let me know! Placenta encapsulation – I have personally decided to move forward with this. I found a place in NJ that picks up it up at the hospital right after delivery and follows OSHA practices, etc. I’m keeping this info to myself for now but once I have my experience with placenta capsules, I will share more! Preregister at the hospital – this can save time when you go into labor. As long as your insurance stays the same, no reason not to do this beforehand. Baby CPR class – we aren’t doing many classes to prep for the baby but this is a MUST. I have no idea what I’d do besides scream, freak out and probably make Jord figure it out, which isn’t an option if he is at work. Pediatrician in Hoboken – I have a few recommendations from friends and our doctor but would like to start interviewing and chatting with some in the area! Hospital packing list – the ever-growing list on my phone, WOW. You’d think you are going away for a month. Once I have a bag packed, I will share the details! Exhaustion – compared the first trimester, my exhaustion is definitely hitting me a bit more as the weeks pass. I don’t have much stamina in the kitchen with recipe testing or walking around the city like I am used to. I definitely am not a lazy potato yet but the more the bump grows, the more tired I feel. I know not to make too many evening plans these days or I will be a dud sitting there. I literally am sleeping at 9:30pm on the couch wanting to go to bed. Thanks to J for being a champ and going to bed too (even though he claims he is so tired….no comment there ha!). Some days my energy is still great but others, I cannot rally. I also don’t think the freezing cold temps here help because all I want to do is cozy up inside. Still working out – yes, I am still working out 3-4x a week for now! Fingers crossed I will be doing this till the end besides my little break/vacation in Florida for a couple weeks in January. I have definitely been slowing down in class and I only do low intensity workouts. I have no shame laying there like a dead whale when I am tired. I have been taking barre3, The Class by TT and just took FPC today. FPC is the Fit Pregnancy Club for mama’s to be and even those who just had babies. Excited to learn more about the community there, I heard it is magical. I just wish it was a bit closer to Hoboken. Overall I am trying to move my body to keep things active without over doing it. Walking is getting a bit chilly but I’d be complaining about that even if I wasn’t pregnant. Hungry hungry + hungry – you’d think I have been fasting for hours with the insane hunger levels I have had recently. My usual snacks aren’t filling me up as much so I have increased the quantity in what I am eating throughout the day. A lot of paleo bagels with eggs and avocado and bacon, grass-fed burgers, pizza (yes with gluten), really anything I am craving in the moment while making choices that satisfy and fuel me. Snacking on my usual Perfect Bars, granola, meat sticks, etc. but more often and increased quantities. Also eating a lot more gluten + dairy to make sure the bub gets some. No food is off limits unless I am allergic and obviously not over here binging – just listening to my body. Craving more savory than sweet now, which is pretty funny for me! Stomaches after eating – yes, this may seem confusing after what I just said above but every night after dinner I get stomaches and feel like my stomach is going to just burst. No matter how much I eat or how slow I eat it, it happens. I will be hungry, eat a typical-sized meal and next thing you know I want to pop. I have learned this is pretty common and then after about an hour it goes away and I’m hungry again. I think it is because my stomach already expands a lot at night so adding more food to it gets uncomfortable. The good thing is it goes away relatively quickly! I make sure to take my probiotic about an hour after eating too to settle my stomach and have lots of water. Forever drinking fluids – I cannot get enough to drink. I definitely need more to drink now than I did pre-pregnancy and even earlier on in the pregnancy. I didn’t think I could humanly drink anymore but this is proving me wrong. I always carry this water bottle around with me to drink from and it is dishwasher-friendly. Swollen ankles – YUP, this is insane. I noticed whenever I sit at a table and do computer work, it gets really bad. If you google “pregnancy swollen ankles” that is me at some points. I have been trying to manage these a bit better by wearing my compression socks, elevating my feet whenever possible and when I sit at a table I obnoxiously put my legs up on a chair unless for whatever reason I cannot. Since my blood pressure is still in a great range and there is no protein in my urine, my doctor isn’t concerned. This can be a sign of preeclampsia, so something to be aware of! Itchy belly – sounds weird, I know, but my skin on my stomach especially is so itchy lately. Since I have really sensitive skin already, I just figured it was something else but then I read on my weekly update that it is because my skin is expanding (hello more belly oil and butter for stretch marks) and it is totally common! Feeling sick? No morning sickness at all, so lucky! Belly button: It is so indecisive. It just looks like it is winking still then sometimes it is looking like its normal self! Things to keep an eye out for in upcoming weeks: my registry must-have’s and hospital packing list! I’m not having a shower so I’m not in great shape with the registry since there isn’t an influx of people needing to send gifts. Need to get my ISH together for that. You look great!! Just ordered the Georgia Grinders PB….How have I not seen this?? Best of luck the last few weeks!! !